The Hudson housing market surged yet again in the fourth quarter, with prices rising across the board. Overall sales for the county were down almost 11% from last year’s fourth quarter, with both multi‑family and condo sales falling sharply due to the lack of inventory available on the market. 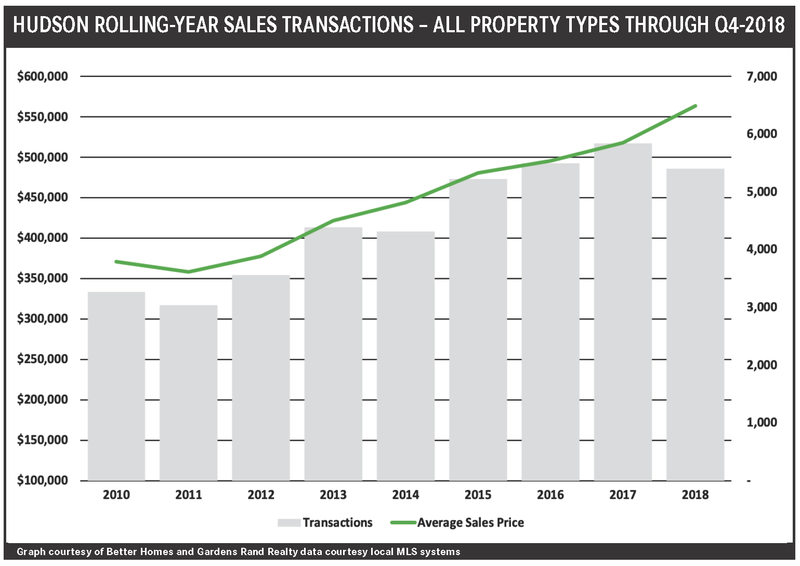 Indeed, for the 2018 year, sales were down 5% overall, falling 9% for multi‑families and 6% for condos, with single‑family homes being the only property type to see an increase, at 5%. But the drop in sales does not indicate a lack of demand, with prices up across the board: quarterly prices were up 14% for single‑family homes, 2% for multi‑families, and almost 7% for condos. And for the year, we’re seeing pretty dramatic price appreciation: single‑family homes up 12%, multi‑families up 12%, and condos up 7%. Going forward, we expect this to continue through a robust winter and spring market, as demand for housing in Hudson remains strong.